Back in May I received a call from a San Diego Mom who was really excited to be coming to Maui in June with her husband Mark and two kids, Nicole, 24, and Matthew, 21. The family hadn’t done a photo session in many years, and with Nicole going off to school for her Ph.D. in the fall, Chein really wanted to document the family before the kids started to go their separate ways into adulthood. “…we fell in love with the islands instantly. There is an energy to Hawaii that I can’t describe–being there brings me so much joy and such a sense of serenity. When our youngest child turned five, we started coming back to the islands regularly as a family,” Chein explained. Because of the importance of this session, Chein decided to book a morning AND sunset session with me, which I have never had anyone do before! I decided to throw in a second location for the morning photo session so we ended up going to D.T. Fleming Beach in Kapalua and then on to a beautiful tree-covered area on the walk to Honolula Bay. Between the two locations, we got lots of fun photos that really captured what a close, fun-loving family they are! After our morning session, we parted ways until sunset where we met up again at Ironwoods Beach in Kapalua. Matching in white and blue outfits, this family looked picture-perfect! Chein did a great job of coordinating not only the photo sessions, but also everyone’s outfits! This family session was truly one of the highlights of the summer for me! Thanks Chein, Mark, Nicole, and Matthew for the privilege of sharing and capturing some special moments with your family! 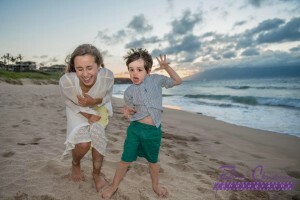 If you would like to book a Maui multi-location family photo session with your loved ones while on Maui, just go to my Contact Me page. You can also check out this blog to read up on some of my client reviews.